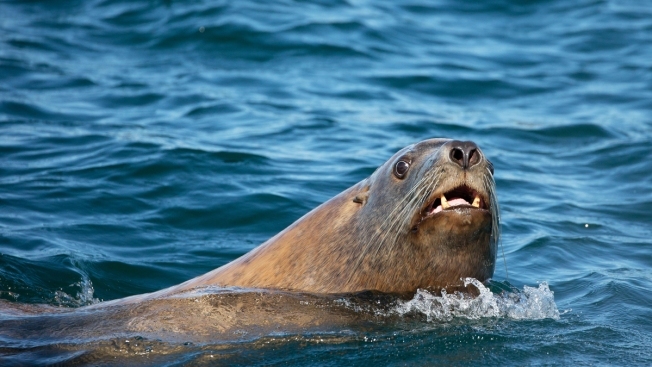 This file photo shows a sea lion off of San Juan Island, Washington State. Thirteen sea lions have been found dead on the shores of Washington state since September, six of them from gunshot wounds and the other seven from suspected human-caused trauma, according to a wildlife welfare group. The Seal Sitters Marine Mammal Stranding Network reported that one sea lion was found with its head sliced off, according to NBC News. Sea lion deaths are more common when fishing runs increase because humans and the animals often go for the same food, according to Seal Sitters. The most dangerous months are still to come. Sea lions and other marine mammals are protected under federal law, and the National Oceanic and Atmospheric Administration Fisheries said in a statement is investigating the deaths.